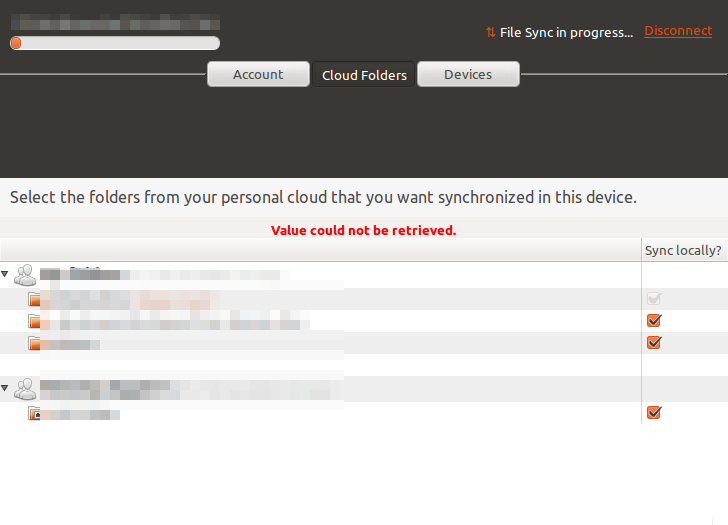 I'm trying to sync files and I keep getting the "Value could not be retrieved" message in the control panel (see attechment). If this is a message that needs to be presented to the user at all, I'd suggest making it a bit more descriptive and user-friendly, as the current text does not give much info on what's actually going on. Thanks for your report. Yes, we need to improve the error messages but is not easy, since we're getting exceptions back from the backend and we need to show a fixed, translatable error for the end users. Right now we can't define strings for all the possible errors from syncdaemon, so we are showing predefined errors. Anyways, I agree we should try to improve this somehow. Sebastien's report was isolated in bug #745790, since is not this exact same issue.